Didn't Dare Do Anything covers the flanks of Napoleon's 1812 invasion of Russia. Over a hundred uniform images! Pre-orders have already shipped! And remember you can select free delivery to conventions such as Cold Wars, AdeptiCon, and the Seven Years War Convention! When is the next Peninsular War book coming out? And if I have my "penguin" shirt do you still get discounts at the show? We haven't announced one yet but we do have plans for multiple titles to add to the one we have out. Indeed, we still run specials at the conventions for anyone wearing their Nappy the Pen-Gin™ t-shirt, so yes! Please do make sure to wear yours! 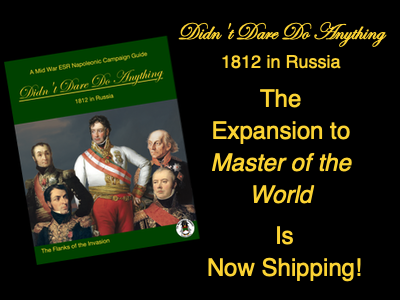 Here is an updated link for Didn't Dare Do Anything, 1812 in Russia as we have recently updated our website.